We were living in the north Pacific coast of Costa Rica. Shaggy was pretty much a local superstar fisherman there. He used to leave his bag of handlines and lures at the house as we lived at the beach and he lived in a little town about five miles inland. 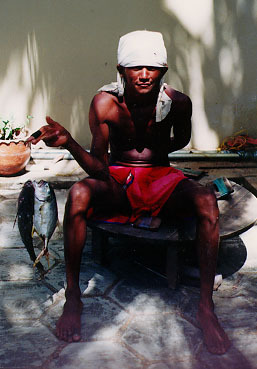 He would stop by for string or lures, or to catch a siesta under the coconut palms during the mid-day heat. One day he stopped by to announce that he was going to catch a shark. He needed a brake cable from a bicycle for a leader that a shark couldn't bite through. He had with him a big handline with about 400 yards of 100 pound test line. One of the charter boat captains had given him a big marlin hook. He planned to catch a jack to use as live bait. He tried for thirty minutes to talk me out of the cable on my bicycle. He finally settled for some colones to buy a couple of cigarettes and went and found his cable somewhere else. When I last saw him that morning he was walking up the beach moving quickly with his long gaited stride. Every evening he would show back up at the house to drop off the lines and bum a little money for a cigarette before he left for home. Each evening I would ask him what he caught. He would frown and give a little shake of the head. Every morning that week he came back, picked up the shark line and headed up the beach. Early Friday afternoon I was doing some work in the wood shop I had fashioned in the house. I heard a low whistle from the beach side of the house. That would be Shaggy. I went out to meet him. "Como le va?" (How's it going?) I asked him. He indicated that things were fine. I asked him if he had caught anything. He shook his head, yes. I asked him what he caught. Un tiburon. (A shark). Shaggy is not one to easily give up information. I asked him how big was it. He held his hand above his head. I asked him where it was. He said that he sold it. I said, "Bull." He lifted the hat from his head letting loose a shower of colones. I later talked to someone who saw Shaggy catch the shark. He said it was a big fish, probably over seven foot long. He said that Shaggy battled it for over two hours, keeping it swimming parallel to the beach so that he could follow along with it. Quite a crowd of locals and tourists gathered, impressed at what a thin Costa Rican shoreline fisherman could accomplish with only a handline and considerable skill.